Request a live demo on your computer to assure that BCSS is right for you before your purchase. Speak with a person: 888-427-5779. Print agreements, labels, tags, receipts, reports and checks. Discount aged inventory. Supports barcodes, cash drawers, receipt printers, QuickBooks. Deluxe plus first-rate thermal labels and tags, multiple computers, buyer records, employee management, mall space rental. Diamond plus consignor online access to account information. Add inventory online and download at the shop. 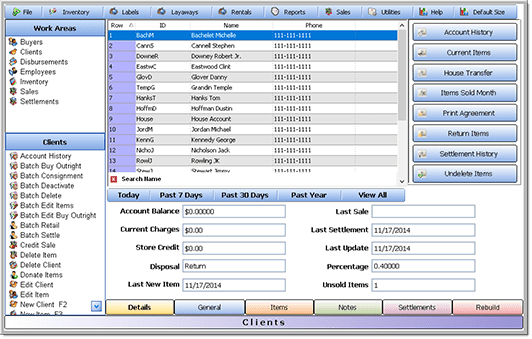 Intro ($295) is POS software program with a training panel - great for procedural reminders and training. Print price labels and hang tags (no barcodes), agreements, receipts, settlements and checks using an ink printer. Inventory is only entered at the point of sale so no records or discounting of unsold inventory - great for simple POS. Colorful intuitive display for easy use. Tiered in price from $295 for new-store budgets. Pay once for lifetime use. No forever outlay! Use Square, PayPal or any card processor. Restrict employee access and actions. Option: Share card costs with consignors and buyers. Option: Consignor online information access. Might sound a bit silly but how long are you intending to be in business? Multiply that number of years by the annual cost of every software program. You'll have to be careful because finding all costs can be so challenging that it becomes impossible. Web-based software costs are harder to hide or disguise. If the monthly rent isn't paid you get evicted. The elephant in the room is the cost of adding additional users or, although you may not be thinking of expanding just yet - the cost to open a second location. Find out now before getting locked in.